Brand comparison, manufacturers' specs, equivalent models, contact point selection, crystal sizes and installation, repair hints and calibration of brand name quality test indicators. Includes Brown & Sharpe BesTest, Compac, Interapid, Mitutoyo and Starrett. 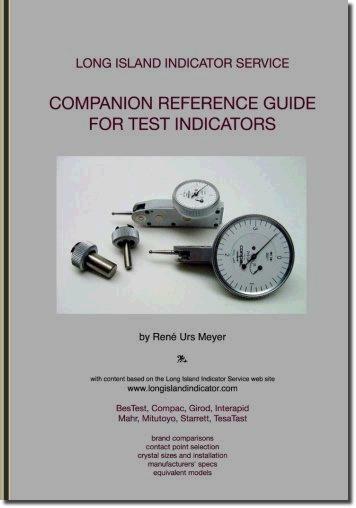 Contains 158 pages based on test indicator content from this Long Island Indicator Service web site. Complete web site contents can be found on our home page. George Meyer arrived at Idlewild airport only to be told that the job he had been promised fell through. Quite possibly the job never existed and he was lured here under false pretenses. Fortunately the Swiss embassy had just received a job listing for a repairman—a repair technician as he would eventually be called—for the exclusive importer of the Swiss-made gages. George was trained to repair these and was sent back to Switzerland several times to get additional factory training. He started his own business when it became clear that other brands, American made brands such as Brown & Sharpe, Federal and Starrett, also required servicing. This was soon followed by other foreign brands when, around 1960, a small group of salesmen from Japan started to make the rounds in the New York area, selling gages from a four-page leaflet printed on newsprint. Mitutoyo is now undoubtedly the biggest player in the field. George eventually turned this home business into Long Island Indicator Service and when I joined in 1980 we set about to expand our services and sales. Thanks to the Internet we survived the exodus of the great aeronautic manufacturers which once populated Long Island. Our business suddenly became national and our website became a helpful source of information on precision measuring gages.